It seems that Samsung is getting itself ready to release a successor to last year's Galaxy J2. 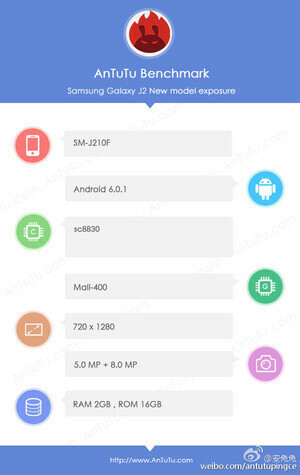 Indeed, rumors and leaked specs for the Galaxy J2 (2016) made an entree on the holy trinity - Geekbench, GFXBench, and AnTuTu. Needless to say, we learned almost all there is to know about this upcoming entry-level device. We only need images of the device to appear on TENAA and we can safely call it a day! That said, a device rolling under the SM-J210F model number just got certified by the FCC, and we are convinced it's actually the Galaxy J2 (2016). As usual, FCC listings don't reveal much about the specs of the device - apart from the claim for a 1,500mAh battery, we learned nothing new. We already know the phone will most likely boast a 5" 720p display, an entry-level Spreadtrum chipset (the leaks are contradicting as to whether it will be an SC9830 or a SC8830 one), as well as either 1.5 or 2GB of RAM. Storage expandability is also a go, and so is a 5MP camera at the back. Finally, Android 6.0.1 should come preinstalled. In case we learn something new about the Galaxy J2 (2016), rest assured we'll let you know. Why not 8mp pr 13mp camera?. Also size should have kept at 4.5-4.7" only.. There are tons of other phones with 5" form factor. 5" screen with 1500mAh battery... win.